The Charm of Home: Thank you Romantic Homes! 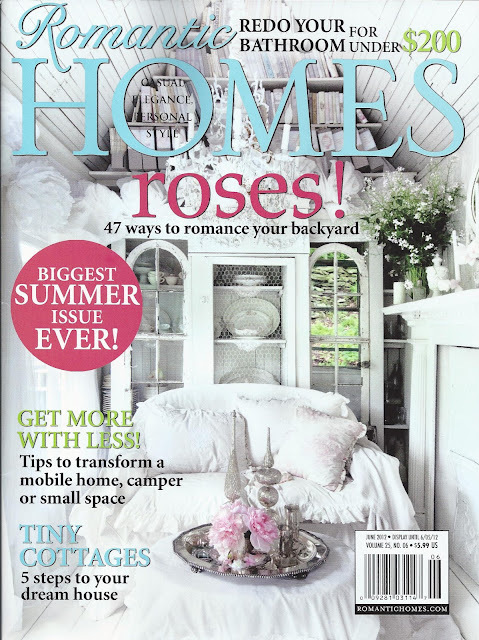 Thank you Romantic Homes for the feature in Site Seeing in the June 2012 issue. Thank you to Beth Livesay and Jacqueline deMontravel for featuring my blog and including me among the talented people of Romantic Homes magazine. I am very honored! Congratulations, Sherry! What a fun honor! Congratulations, so nice for you. wow- how lovely and well deserved- CONGRATS! Congratulations!!! I'm not at all surprised to see your blog featured in Romantic Homes. Your photographs are so beautiful and now even more people will be able to enjoy them! Congratulations! I just saw that issue at the grocery store this morning and I decided not to get it. I'll have to go back now. Did you hear my squeal of delight when I saw you in this issue! Wow, congrats on being featured in such wonderful magazine. It must be so exciting! Congratulations, Sherry! I was pleased to find your blog featured in the magazine. Nice photos. Enjoy your weekend. Congratulations on the well deserved feature, Sherry! Congrats on your feature in Romantic Homes! I saw it and thought I know her. I'm so happy for you, Love that magazine. Congratulations on your feature! :D I saw it in this month's Romantic Homes. So nice to meet you through your blog and Debbiedoo's Copy Cat Challenge! I am your newest follower. You deserve it..lovely photo's and always done with taste.. I'm delighted to see you featured! Well deserved!